Hoping to send a family member home for the holidays? Or need a unique stocking stuffer? Delta Gift Cards can be purchased in flight on delta.com and are now available at more than 15,000 grocery, home improvement and office supply stores across the U.S. Gift cards can be used toward airfare on delta.com, at the airport, through Reservations or by phone with Delta Vacations... and the value never expires. The cards are available in $50 and $100 denominations in stores and in variable amounts up to $1,000 on delta.com/giftcards. Don’t let long airport security lines turn you from a jolly elf into Ebenezer Scrooge. A faster way through security is now available at an exclusive rate for U.S.-based SkyMiles Members, thanks to Delta’s partnership with CLEAR. CLEAR is the only U.S. biometric identity verification platform that uses fingerprint and iris I.D. technology to expedite the document check portion of the TSA security process. The program is currently available in 17 of the airports Delta serves, with five more coming soon. To enroll in CLEAR and take advantage of special SkyMiles Member-only pricing, including free membership for Diamond Medallion Members, visit delta.clearme.com. Exciting new content is coming to Delta Studio in time for the holidays, including selections from Refinery29 and WNYC Studios. Delta Studio’s industry-leading in-flight entertainment collection consistently provides the best depth and breadth of content in the skies and is free for all customers on two-class aircraft. Download the Gogo Entertainment app before flying or even in flight to stream all that Delta Studio has to offer. You’ve made your list and checked it twice, and now you can check that all your belongings (and gifts!) make it to your final destination with you. The Fly Delta app now works in sync with the airline’s Radio Frequency Identification (RFID) bag tags that are printed everywhere Delta flies. This technology amplifies Delta’s industry-leading Operational Performance Commitment to reliably deliver the 120 million bags that fly on its aircraft each year. Customers can keep tabs on their checked bags with a map view of the bag’s last scanned location, along with push notifications that provide real-time monitoring of the bag’s journey from airport to airport and transfer from plane to plane. 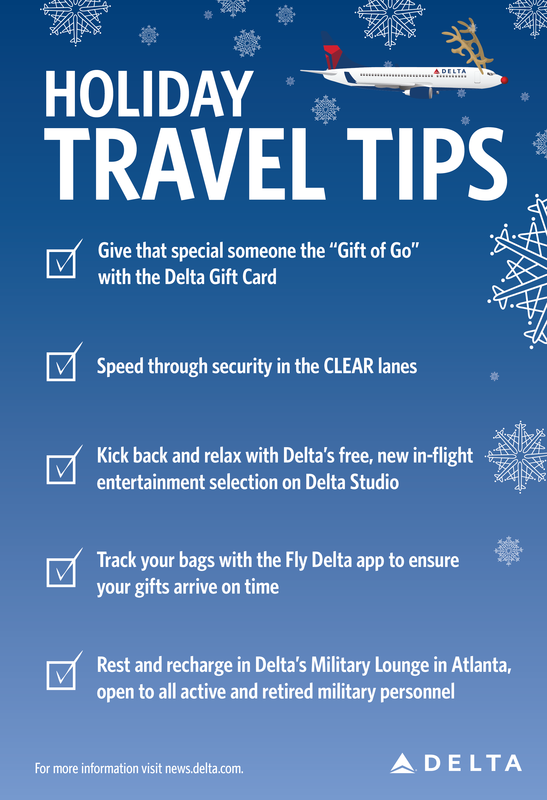 Download the Fly Delta app to stay connected at all points during your journey. It’s one small way Delta employees and retirees salute and show their appreciation for U.S. military personnel as they travel during the holiday season. Now in its 47th year, the Delta Military Lounge provides free food, beverages and activities to all active and retired service men and women and their families. Visitors are also able to watch movies, listen to music, make crafts and play games. The lounge is located on B Concourse in Atlanta’s Hartsfield Jackson International Airport, across from Gate B33. It is open daily from 6 a.m. – 10 p.m. Nov. 28 – Jan. 2. If you’re not traveling to or through Atlanta, you can stop by one of these USO airport lounges, located in several Delta hubs across the U.S.